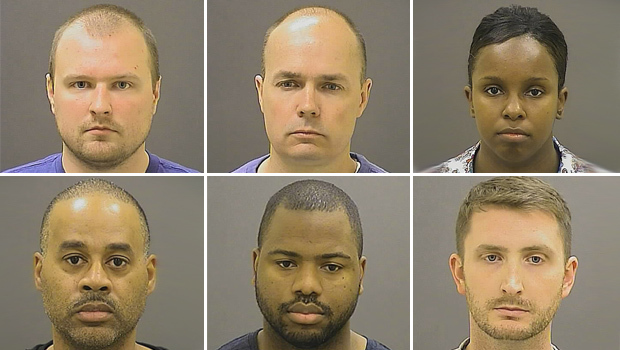 BALTIMORE --State's Attorney Marilyn Mosby announced grand jury indictments against the police officers charged in the death of Freddie Gray Thursday. "These past two weeks, my team has been presenting evidence to a grand jury that just today returned indictments against all six officers," she said, indicating that charges are often revised based upon evidence discovered. However they were largely similar to the ones Mosby announced earlier in May. The charges against the officers range from second-degree depraved heart murder to involuntary manslaughter to assault. The heaviest charges area against Officer Cesar Goodson Jr., who was driving the van that Gray was handcuffed in and allegedly suffered fatal injuries. Gray was arrested April 12, and died a week later. Mosby has said Gray's neck was broken because he was injured while in handcuffs, shackled and placed head-first into the police van. She says his pleas for medical attention were repeatedly ignored. On May 1, Mosby declared that Gray's death was a homicide, his arrest was illegal, and his treatment in custody amounted to murder and manslaughter. "The findings of our comprehensive, thorough and independent investigation, coupled with the medical examiner's determination that Mr. Gray's death was a homicide," she said at the time, "has led us to believe that we have probable cause to file criminal charges." The charges against Goodson, along with Ofc. William Porter, Lt. Brian Rice, Ofc. Edward Nero, Ofc. Garrett Miller, and Sgt. Alicia White came after days of social unrest in Baltimore that left 20 police officers hurt and did extensive damage throughout Baltimore, paralyzing the city and prompting officials to issue a curfew over the course of several days. Arraignment against the officers in the case is scheduled for July 2, Mosby said.